Kerala Floods - Central Help Sufficient? 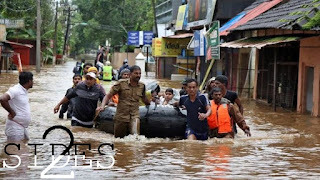 HomeSouth IndiaKerala Floods - Central Help Sufficient? The southern state of Kerala has been battered by heavy rains and flooding, the worst in almost a century. Every single district in the state has been affected, with red alerts having been declared in 13 of the 14 districts. 33 dams in the state were also forced to open their shutters leading to large-scale inundation of many major and minor towns, cities and villages. Flash floods and landslips have also led to widespread destruction of property and loss of life, with the official death toll having crossed 350. With conservative estimates of damage at over 20,000crore rupees, the state government, headed by Chief Minister Pinarayi Vijayan, had appealed to the central government for assistance in rescue operations as well as for rebuilding the state. After an initial allotment of 100 crore rupees, Prime Minister Narendra Modi visited the state, and after an aerial survey of the calamity, has allowed a further 500 crores in relief besides other central assistance in rebuilding and monetary assistance of 2lakh for kin of those who lost their lives and 50,000 rupees each for the injured. Various states, organisations and individuals have also pitched in various amounts to the Disaster Relief Fund for Kerala. The international community has also provided support, notably, the United Arab Emirates(UAE) declaring around 700 crores as relief for Kerala. The centre's response to the disaster that was unravelling in Kerala had been sluggish. The initial allotment of 100 crore rupees was grossly insufficient against the state's original request for 1220crore of relief funds. As the intensity of the crisis swelled, the apathy of the central government - both as relief to the state and in terms of allocating resources for rescue operations - as well as national media was panned by the state populace. So much so that MP Shashi Tharoor had to lament that "the farther you are from Delhi, the less you matter in today's India". Though Kerala Chief Minister Pinarayi Vijayan had been graceful enough to state that he sees the Centre's role in the operations with positivity, the common folk are less pleased. The disinclination by the government to declare this calamity, which has affected more than 10 lakh human beings so far, as a national disaster and help thus has further drawn ire. Many have taken to social media to express their discontent with the central government. Some have also pointed out how BJP ruled states which faced a similar, albeit less severe, situation in recent times had been given a much more generous treatment. A popular social media trend in Kerala was to post variations of "I declare the central government a national disaster". Cloaked in humour as it may be, these posts shows how deep those affected by the deluge feel that the centre has let them down. Adding insult to injury, the government has also said no to international relief to the state. Claiming that relief provided by state and centre combined is enough for the time being the centre has rejected UN's relief to Kerala. This is nothing more than a politically motivated move by the centre to avoid the loss of face when, in monetary terms, foreign countries and agencies would end up helping Kerala much more than the Indian government itself. Rejecting humanitarian aid, intended to help those affected by the calamity, on purely political considerations is a new low, and will and should reflect badly on the government in power at the centre. The centre has been coordinating closely with the state government in Kerala since the start. Multiple central forces, NRDF, boats, choppers all have had been pressed into service and have played an important role in the rescue and relief operations throughout the state. The accusation that the centre has been lax to define the Kerala floods as a "national disaster" is unfounded and fake news. There is no provision called "national disaster". On the contrary, it has been declared as an L3 level disaster, a 'calamity of severe nature', which is the highest classification available. Further, allotment of funds is not an arbitrary decision, it follows well-established rules based on need. Right from the 2004 tsunami which struck India, it has been the unwritten rule in foreign policy to not accept external aid for disaster relief. The state and centre, with the help of the overwhelming civilian participation by the people of Kerala themselves, have managed to mitigate the magnitude of this natural calamity. In such a situation, India has no need to accept foreign money to tackle an internal issue. Further, international aid never is done in isolation, and almost certainly come with riders and/or return favours which may not be in India's long-term goals. It would also not be a good sign to possible investors that India has to accept such large aid in order to tackle an issue at home. The comparison with help offered to other states with "less severe floods" ignores other factors, such that Kerala is coastal whereas those earlier affected by flooding are mostly landlocked states with no avenue for flood waters to recede. Further, a simple comparison with the 2013 flooding, when Congress was in power at the centre, and more than 5000 people lost their lives due to flash floods and landslips, shows how the current BJP government has been much more generous with funds. The current adverse noises being made are just overreactions by the unscrupulous with a view to gain political brownie points in the midst of a humanitarian crisis. Help Kerala get back on its feet. Contribute to the Chief Minister's Disaster Relief Fund. Visit https://donation.cmdrf.kerala.gov.in/ to know more.